Visitors to the Polynesian Cultural Center will now have a chance to see voyaging canoe Iosepa up close. The Polynesian Cultural Center is celebrating its 45th anniversary this year with a new attraction debuting this summer. The Laie tourist destination will be displaying the Iosepa, a prized voyaging canoe belonging to Brigham Young University-Hawaii. The Iosepa will be housed in a new structure in the center's Hawaiian Village, part of a seven-month renovation that was constructed to the tune of $2.65 million. Visitors will be able to get up close to the double-hulled training canoe that is arriving this week from Kawaihae Harbor on the Big Island, accompanied by a BYUH student crew. "The canoe is a living classroom," said village manager Raymond Mokiao. "The students have been out at sea for about a month, drilling around the islands. Working under an experienced crew captain, the 10 students from BYUH are mostly Hawaiian studies majors." 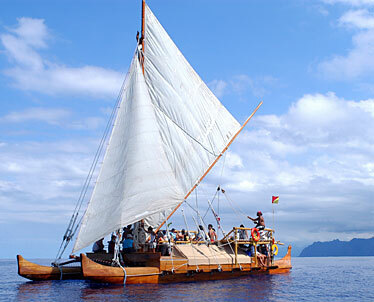 Apart from the couple of times a year when the Iosepa will be at sea, the 57-foot canoe will be housed in Halau Wa'a o Iosepa ("Canoe House of Learning"), a large, triangular house made of laminated wood, where visitors will learn the techniques and traditions behind Polynesian voyaging. The exhibit, "Iosepa: Voyage of Discovery," will also include two video screens that will show documentaries about the making and voyaging of the canoe. Exhibit guides will teach visitors about stocking provisions for a voyage, tying nautical knots and navigating using a star compass. The compass itself is the focal point of a small amphitheater. There will also be a dramatic cultural presentation that shows how eight families from all over Polynesia migrated to Hawaii. Management of the canoe house will be a joint effort between the center and BYUH's Jonathan Napela Center for Hawaiian Language and Cultural Studies. "IT'S EXCITING to have such an authentic representation at the center with such strong cultural ties," said Keali'i Haverly, a BYUH graduate and former student crew member who is now manager of local and e-commerce sales at the center. "It was always the primary role of the faculty and staff to do primary maintenance on the canoe, but when the call out was made that this exhibit was going to be built, the local community got so heavily involved as well." "The canoe needed a home," cultural director Cy Bridges said. "For the past five years, it's been stored under a tent in the back of the school by the tennis court, so it's good that we find it a safer home and give it more prominence. It's a natural fit for the center to house it, and gives visitors a rare opportunity to get up close to a working canoe." He said that the voyaging canoe was named in tribute to a Mormon colony of Hawaiians that relocated to the desert area of Skull Valley, Utah, in the late 1800s. Wanting to be closer to church headquarters, Iosepa had the distinction of "being the most beautiful community, complete with a man-made lake." When the Church of Jesus Christ of Latter-day Saints built a temple in Laie, the townspeople moved back to their original island home. "Being involved with the canoe is a very spiritual experience," Haverly said. "As students, we've always been told that your involvement with the Iosepa, what you put into the work, you'll get that back. My eyes were opened spiritually, and I felt that our ancestors are there to support us on our voyages. "It's an amazing experience to feel the aloha from our kupuna."